We finally had some time to play in the Disneyland Parks! We wandered into California Adventure like we always do on Disney days, hit up The Little Mermaid ride, Monsters Inc. and even caught the Aladdin Musical. My heart was bursting with excitement to head over to Disneyland. I am truly a child at heart here and this is my happy place. I'm proud to say Malakai is a true Disney kid. He loves it! I wasn't very surprised by the crowd when I wandered into Disneyland around 5P.M. 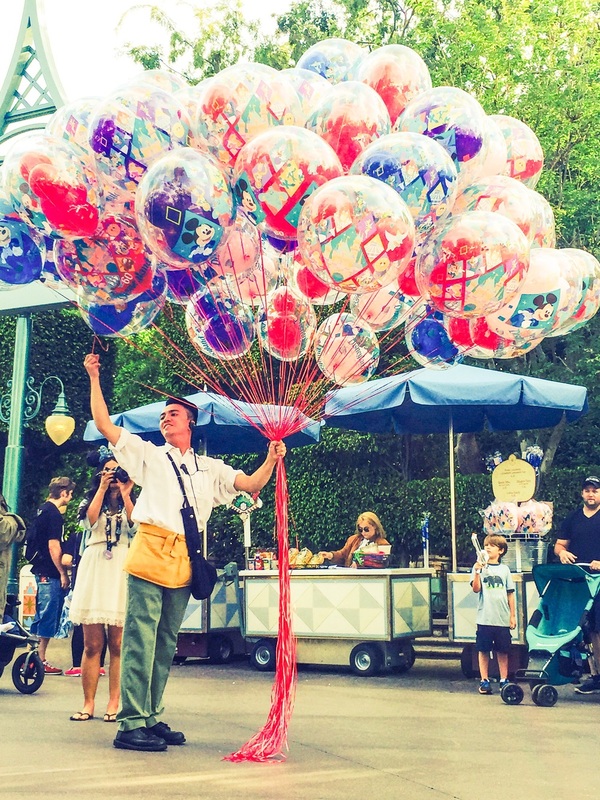 Holy Moly, we were not the only ones wanting to celebrate Disneyland's Diamond Celebration. We grabbed a snack, and by 6P.M. We had a spot picked out to watch the Paint The Night parade. It started at 8:50P.M. Luckily, Malakai slept for an hour and was happy to have snacks and people watch with me while we waited for nightfall. Do you remember the original electrical parade? Do you remember the music and the excitement? Ok, well.. Paint The Night is all that times 10 on crack! This parade is AMAZING. I was speechless. I was in awe. I was misty eyed. The pictures are beautiful but they don't do this parade justice. I had seen pictures on Instagram, desperately trying to get a sneak peek and I was still awestruck when I saw it in person. My husband kind of laughed at me when I told him I got teary eyed during the parade. I don't know what it is, I think between seeing an extremely updated version of the electrical parade, a parade I saw as a child and then seeing my own child's face light up with excitement as he was waving and screaming "Hi!" at his favorite characters passing by on a float, I just lost it. A flood of childhood memories came over me. I sat there for a second and closed my eyes and breathed in the turkey legs, cotton candy, Mickey shaped pretzels and other distinctive scents from this magical land. I thought about the first time I saw the electrical parade. I was young and stuck in the wonder that Disneyland creates. Now my son had the same beam in his eyes. At the end he looked at me and said "Wow Mom! That was good! I wanna see it again." I know the feeling son. We sat and waited for 3 hours for this parade. I wanted great seats on the curb. I would do it again in a heartbeat. Disneyland has done it again. Paint The Night is pure magic. No monetary compensation was received for this post. We are Disneyland pass holders and this opinion is my own.